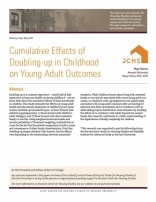 Doubling-up is a common experience—nearly half of kids experience at least one double-up during childhood—yet we know little about the cumulative effects of these households on children. This study estimates the effects on young adult health and educational attainment of childhood years spent in three doubled-up household types: 1) those formed with children's grandparent(s), 2) those formed with children's adult sibling(s), and 3) those formed with other extended family or non-kin. Using marginal structural models and inverse probability of treatment weighting, methods that account for the fact that household composition is both a cause and consequence of other family characteristics, the author finds that doubling-up shapes children's life chances, but the effects vary depending on the relationships between household members. While childhood years spent living with extended family or non-kin are associated with worse young adult outcomes, co-residence with a grandparent is not significantly associated with young adult outcomes after accounting for selection into these households, and co-residence with an adult sibling may be beneficial in some domains. By studying the effects of co-residence with adults beyond the nuclear family, this research contributes to a fuller understanding of the implications of family complexity for children.